A couple months ago we added the feature of collecting online reviews (Google, Yelp, etc.) to the Rocket Referrals platform. Since then we’ve improved the online visibility and reputation of several insurance agencies across the country. Along the way we are often asked “why” we collect online reviews, “how” they will help their agency, and “what” the process entails. So, I figured I would just write a blog post about it for all you curious minds. Most of you have heard of the term SEO (search engine optimization), as it tends to be a buzzword not only in the insurance industry, but just about every you look. Simply put, SEO is the process of ensuring your website ranks high when people search for a related topic online. Over the years SEO has become rather complex. The search engines (Google, Yahoo, etc.) offer different breeds of search and are constantly changing their algorithms in hopes of improving the user experience. Keep in mind that search engines are most interested in catering to the end-user (the guy or gal searching online) and not the businesses. 67.7 percent of all U.S. search results are from Google. Therefore most of what I discuss below, including examples, will be from Google search. At the end of the day the businesses will pay to be where their prospects are – which provides Google with one of their highest revenue streams through Adwords (paid placement on search). In fact, advertisements account for nearly 90% of Google’s annual revenue at over $59 billion. So that’s how Google is making all that money! Improving SEO traditionally meant finding ways to improve a business’ ranking on organic search results. Being “organic” means that the search results don’t include any pesticides or are genetically enhanced in any way. Joking. It means that websites appear higher in search rankings because of their relevance to the search terms, rather than being paid for. For a business, showing up on organic search is much more productive than paid advertisements. One study showed that 94% of people click on organic search results over paid advertisements. Ranking higher with organic search isn’t easy. So many factors go into how businesses are ranked including things like website keywords, number of external links to website, etc. There are thousands of companies out there that specialize on helping businesses rank higher in organic search. It is no easy task. There is a new breed of search that is becoming increasingly relevant: local search results (essentially a subcategory of organic search). Google recently updated its algorithm (Pigeon) to rank local businesses higher in search – essentially giving them a free pass over most organic search results. Not to say that organic and local search are not related. They certainly are. Location of the business is a significant factor for organic search results. But local listings, which are tied directly to Google Maps, regularly appear at the top of the search – especially when insurance related terms are searched for e.g. “home insurance”, or “car insurance des moines”. Take a look at the example below of the different types of search results. 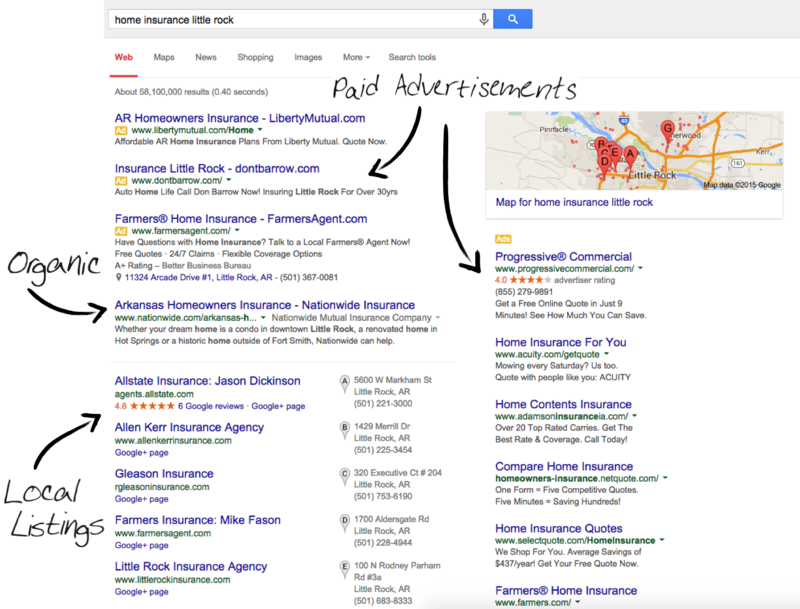 Ultimately, as an insurance agency operating within a region, the goal is to rank higher in local search results. This way your agency will be placed in a prominent location with relevant searches. According to Google, three factors influence Google local search rankings: Relevance (matches search), Distance, and Prominence (how well known the business is). A significant component of “prominence” is online reputation from online reviews. Google will take reviews from many different online sites into consideration (including Yelp, Facebook, Google, etc.) which all influence the rankings on Google local search. We’ve established that collecting online reviews help your business rank higher on organic (including local) search results. The next—perhaps obvious—benefit is that online reviews will help your business stand out from the crowd. 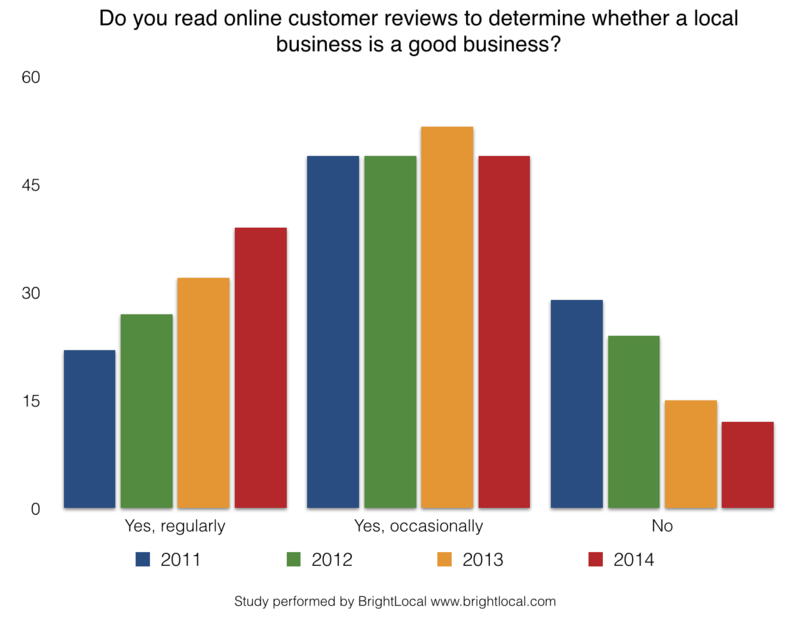 A 2014 study by BrightLocal suggests that the American consumer is increasingly using local reviews help make purchase decisions. Their latest survey shows that 88% of consumers use, at least occasionally, local online reviews during the buying decision process. The bottom line is that online reviews are an important tool for consumers to judge the quality of a business. In the insurance industry there is currently a large opportunity for agents to stand out online. The vast majority of insurance agencies have at most 1 or 2 reviews online. Many have none at all. Put yourself in the shoes of a consumer searching online for insurance. Would you rather chose a rather unknown agency, or one that has a handful of positive reviews? Research, not to mention common sense, shows that online reviews provide social proof which impact purchase decisions. In the above example we saw that only one agency had any reviews at all. A natural first pick for most shoppers searching from Little Rock. Or, take the following example. 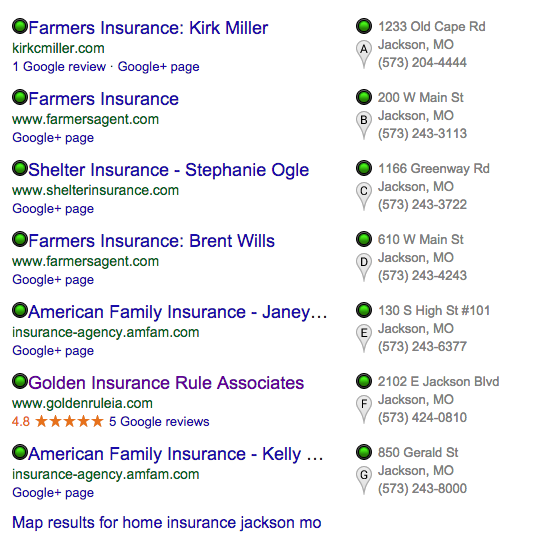 I searched for “home insurance jackson mo” with the following Google local results. Which agency stands out to you? I took it a step further and clicked on the “Map results” at the bottom of the search results. I got the following. Golden Rule Insurance stood out like a sore thumb. But in a good way. No matter how you slice it the insurance agency with a handful (more than a couple) reviews will catch the eye of the consumer. A disclaimer, Golden Rule Associates is a client of ours and used our automated review feature to increase their online reviews. Okay you understand – now how do you do it? First things first, you want to ensure that your website is “with the times”. The better your website the higher you will rank on organic (including local) search. For some quick tips check out this blog post by AgencyBloc on what makes a good website for insurance agencies. Claim your Google+ and Google Business Page and your Yelp Business Page. Identify who your best clients are using the Net Promoter Score (NPS). Collect testimonials from your best clients. Ask those clients that gave you a testimonial to review you online. We have a more in depth explanation of how to use the NPS to collect reviews and grow your business. There are some important things to keep in mind using this approach. Google and Yelp have policies regarding soliciting for reviews. Therefore, you have to go about it carefully so you don’t get penalized (decreased search rankings, deleting reviews, or even removing your business from search listings). That’s why reviews need to be collected over time and across several platforms to get the best results. To be frank, collecting reviews online from the right clients (five star) can be complicated and time consuming. That’s precisely why we added the functionality to Rocket Referrals to do it for our agents automatically. Rocket Referrals has the intelligence to ask only an agency’s best clients for reviews, to do so over time, across several platforms (Google, Yelp, Facebook, etc. ), optimize reviews for mobile and computer, and to make it so easy for clients that they actually respond to review requests. So now you should understand why reviews are important and have a basic understanding on how to get them. So let’s get started! 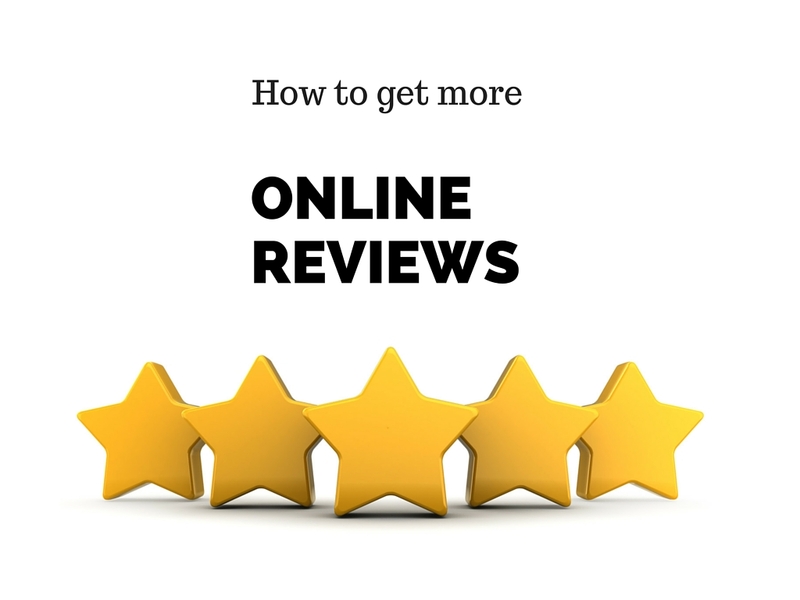 Ready to get more online reviews for your agency? Claim your spot for a 30 minute demo.